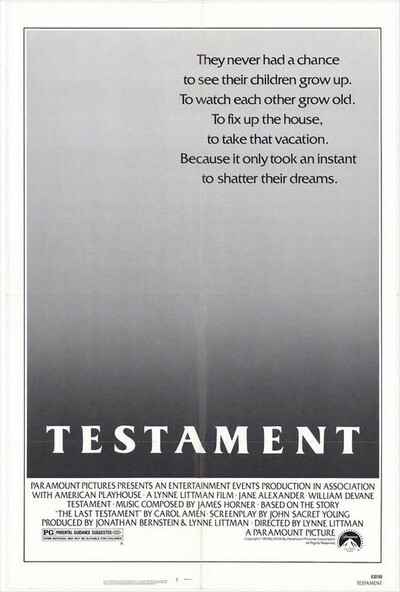 "Testament" may be the first movie in a long time that will make you cry. It made me cry. And seeing it again for the second time, knowing everything that would happen, anticipating each scene before it came, I was affected just as deeply. But the second time I was able to see more clearly that the movie is more than just a devastating experience, that it has a message with a certain hope. The film is about a suburban American family, and what happens to that family after a nuclear war. It is not a science-fiction movie, and it doesn't have any special effects, and there are no big scenes of buildings blowing over or people disintegrating. We never even see a mushroom cloud. We never even know who started the war. Instead, "Testament" is a tragedy about manners: It asks how we might act toward one another, how our values might stand up, in the face of an overwhelming catastrophe. The movie begins with one of those typical families right out of TV commercials. The father (Wiliam Devane) is a physical-fitness nut. The mother (Jane Alexander) is loving, funny and a little harried. The kids include a daughter who practices the piano, a son who races his dad up hills on their 10-speed bikes and a little boy who guards the "treasure" in the bottom drawer of his chest. The movie follows these people long enough for us to know them, to appreciate their personalities, their good and weak points, and then one sunny afternoon the war starts. Most of the film is about what happens then. Anarchy does not break out. There is some looting, but it is limited. For the most part, the people in the small northern California town stick together and try to do the best that they can. There are meetings in the church. There are public health measures. A beloved community leader (Leon Ames, of TV's "Life with Father" many years ago) is a ham-radio operator, and makes contact with a few other places. A decision is made to go ahead with the grade-school play. Life goes on ... but death invades it, as radiation poisoning begins to take a toll, first on the babies, then on the children, until finally the cemetery is filled and the bodies have to be burned on a pyre. The movie finds dozens of small details to suggest existence after the bomb. All the kids, for example, take the batteries out of their toys and, computer games, and turn them in for emergency use. Gasoline is rationed, and then runs out. The survivors have no garbage collection, no electricity, and, worst of all, no word from elsewhere. The sky gradually grows darker, and I was reminded of those recent studies suggesting that a real nuclear war would finally kill us all by raising great clouds of dust that would choke the Earth's vegetation. In the midst of this devastation, Jane Alexander, as the mother, tries to preserve love and decency. She stands by her children, watches as they grow in response to the challenge, cherishes them as she sees all her dreams for them disappear. It is a great performance, the heart of the film. In fact, Alexander's performance makes the film possible to watch without unbearable heartbreak, because she is brave and decent in the face of the horror. And the last scene, in which she expresses such small optimism as is still possible, is one of the most powerful movie scenes I've ever seen.